Energy price declines should provide a benefit to global growth and lower inflation. Real growth could be materially boosted by lowered energy and gas prices by as much as $100 billion in the United States alone, as the lower price acts as a positive shock to consumption. On the flip side, we recognize that the impulse for lower prices emanated from weaker demand from emerging markets. Should the Federal Reserve (Fed) proceed with a midyear rate hike, one less prop for commodity prices will be removed. It is hard to interpret exactly how much of this is already priced in to markets, and especially emerging markets, which have borne the brunt of the adjustment. It is our general sense, though, that many emerging equity markets have already discounted a significantly worsened outlook from a few short years ago. 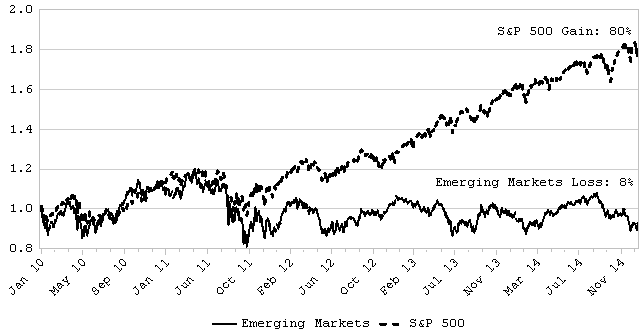 As a group, emerging markets have significantly lagged the S&P 500 for years now. Over the last five years, the S&P 500 advanced 80% compared to a negative 8% return for emerging markets (chart below). In stark contrast, U.S. equity markets have been the go-to asset for global portfolio flows seeking above-average returns. At today’s relatively low valuation levels, it is hard to see how emerging markets are not a better looking long-run proposition than they were in 2007 when relative valuations and investor interest were at much higher levels. Investors are no longer pouring large amounts of capital into emerging markets and risks are more widely recognized today. Prior to 2008, emerging markets benefitted from a wave of consumption coming from the developed world. That consumption wave produced a large current account deficit in the United States and created equally large surpluses in much of the emerging world. Since 2008, this process has been in various stages of unwinding and formerly attractive, looking investments in emerging markets are no longer producing the returns initially expected. Central bank liquidity programs and quantitative easing has helped relieve some of the pressure, but a good amount of bad investment from those more prosperous times are yet to be recognized. To the extent that any given emerging market depended on foreign borrowing to finance investment, the potential for a crisis remains and periodic crisis in emerging markets are not to ruled out. As investors, we must weigh these risks against potentially higher returns other portfolio benefits that come with emerging markets. In the end, we find that higher risk and higher reward usually go hand-in-hand. We say this usually, because at extremes of exuberance and pessimism, prospective returns can fall below levels that compensate investors well for taking on risks. This appears to have been the case for emerging markets in 2007. Over the past several years, we have watched the excitement and fervor associated with emerging markets investing fade away. No longer are investors clamoring for exposure to these markets. Valuations are far more reasonable than they were in 2007. We accept the fact that more bumps may happen as emerging markets move toward an eventual recovery, but we also recognize the potentially better long-term growth that follows from growing populations, rapid adoption of technology, further anticipated growth of capital investment, and continued integration of emerging markets with the rest of the world through trade and other linkages. For these and other reasons, we are no longer as bearish on emerging markets as we have been in recent years. We now see merit in maintaining at least a neutral weighting toward emerging markets in portfolios despite increasingly known near-term risks. As for other foreign markets, we are less enthused. The core of our recommended equity portfolio remains focused in the United States, where we see better potential for continued steady growth. Based on a relative comparison of valuation, growth, and expected cash flow between U.S. equity markets and foreign developed markets (represented by the MSCI EAFE index), we conclude that there is still insufficient reason to tilt portfolios away from the United States and into other developed foreign markets. Accordingly, while we are more constructive on emerging markets today than in the past, we remain domestically focused for the core of our equity allocation at this time.